...it is imperative that the American people, even if they do not agree with the teachings of Islam, do not wrongly blame Islam for everything done in its name. Religion [the belief in and reverence for a supernatural power or powers regarded as creator and governor of the universe] is a man-made institution; a meme (see this video by Dan Dennet for a great presentation on memes) that offers humanity, like many man-made things, a two-edged sword. Don't like the way a neighbor's cattle keeps eating your crops...Thou Shalt not kill him. You're already married but you think your neighbor looks kind of cute...Thou shalt not commit adultery, etc. 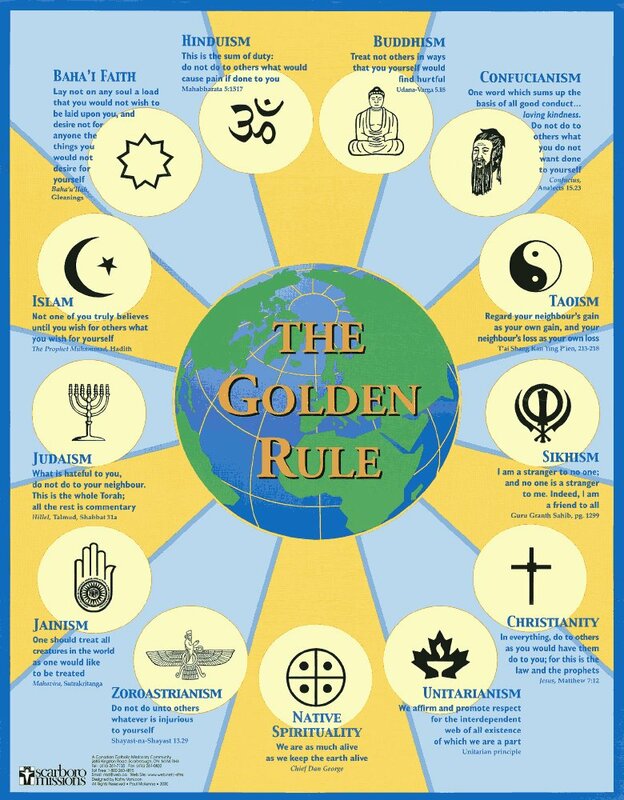 It can be argued that the 'Golden Rule', a foundational principle of many religions, is the chicken to the egg of cooperation as an evolutionary survival strategy . The second edge of the sword has historically been used as a justification for violence and subjugation. Examples include the Inquisition, Taliban's brutality to women and the Islamic theocracy in Iran. Humanity's challenge today is the terroism justified by religion; more specifically, by Isalmic Facist. At one time in man's history we accurately used the stars to navigate even though we believed they revolved around the Earth. Religion was even used to subjugate anyone that questioned an Earth-centric philosophy. Logic enlightened us beyond this misnotion. Humanity, through either nostalgia or custom, holds on to religion at its peril. 'Racking up a body count' by definition goes against the Golden Rule. The historic facts of man's inhumanity to his fellow man are indeed facts, but not an argument for an transcendent Lawgiver. As to the Kalam Cosmological Argument (KCA)...for arguments sake let's accept that it is a 'logical' argument which concludes that the Universe must have a 'creator'. The 'argument' itself then falls apart when its very methodology is then applied to the 'creator' KCA concludes within its argument. Or put more simply, what process created the 'creator'? If you're in for a dime with the KCA argument you have to be in for a dollar as well; i.e., applying the KCA 'search algorithm' to the question of the 'creator' itself. The Gospel of Jesus Christ is not a man-made "philosophy." There's no middle ground. Either you believe and accept the claims of Christ and His Atonement for your sins, or you don't. Apparently you don't. (Yeah, I know, there's no such thing as "sin." So say you and most of the cultists.) I never, ever figured you for an atheist who would side with liberals and Marxists in denying the existence of God and advocating a situational ethic as opposed to the existence of absolute truth. You and I could argue this till the cows come home, and I suspect we'd never arrive at any conclusion other than our two starting points. I feel sorry for you (yeah, I know; you are insulted), because the way it looks right now, you won't realize the truth until the lites go out for you in this life. And then it will be too late. And spare me your ridicule, sarcasm and your jaded cynicism. I've talked with you Carl Sagan types ad infinitum, ad nauseum. You have no respect for my Christian commitment, and I have no respect for your materialism and, no doubt, your incredible faith in blind chance as your creator. I suggest four books for you to read, all four written by former atheists: 1) C.S. Lewis' Mere Christianity, 2) Lee Strobel's The Case For Christ, 3) Dr. Josh McDowell's More Than A Carpenter and 4) Dr. Hugh Ross' The Creator and The Cosmos. BTW, I was an agnostic myself (and I understand what it means and the origins of the term with Thomas Huxley), steeped in a deeply antagonistic hostility toward religion of any kind, particularly Christianity, until I became a Christian in 1977 in my 30's. That's why I ask that you spare me the ridicule, the sarcasm and the cynicism. I've not only heard it all, I've espoused it all. Mario, I saw this post and felt like a bull shark sniffing blood in the water! I couldn't resist responding. I don't know who TNP is, but have you guys locked horns before? He seems kinda ... prickly. This is TNP. Your comment is perceptive, Brain Shavings. Last year about this time, Mario (?) and I had some disagreements regarding the teaching of intelligent design and the theory of evolution in the public schools. And I apologize for sounding "prickly." I try my best to speak (or write) the truth in love, but I sometimes fail. I guess I'm so used to defending my faith that I sometimes forget to demonstrate my faith by letting others see the love of Christ in me. Your "blood in the water" analogy is apt as well. Just found your blog and I like it. Please check out my blog at conservative-atheist.blogspot.com and my web site at www.conservativeatheist.com. I'll look around your site and give you some more specific comments as I have time.